Located at Cooper Landing in the middle of the Kenai Peninsula, the Kenai Princess Wilderness Lodge is perched high above the beautiful turquoise waters of the Kenai River. 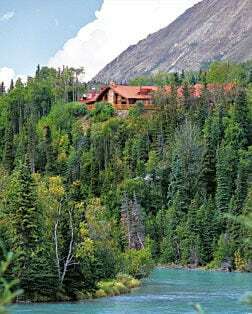 The lodge is the base for many wilderness activities and the starting point for the scenic drive to Seward, gateway to Kenai Fjords National Park. Cooper Landing was first settled by the Kenaitze Indians, who set up fish camps along the upper Kenai River. More recently, Cooper Landing was the site of the first gold discovery in Alaska in 1848, the year before the California Gold Rush. Early Russians discovered the gold but proved more interested in the fur trade. From Cooper Landing, the Kenai River flows 75 miles before entering Cook Inlet. World-famous fishing, scenic float trips and hiking are all located just a short distance from the lodge's front door. The 690,000-acre Kenai Fjords National Park is dominated by the expansive Harding Icefield, feeding dozens of deep-blue glaciers that tumble down into the waters of the bay. Kenai Rivers are known throughout the world for their abundance of fish. Both have four out of the five species of Pacific Salmon that return to spawn each season in Alaska, as well as Rainbow Trout. Exit Glacier is part of the Kenai Fjords National Park, and is derived from the Harding Icefield in the Kenai Mountains. Alaska's only public aquarium and ocean wildlife rescue center is located on the shores of Resurrection Bay. This ''window on the sea'' offers close encounters with puffins, octopus and sea lions. Lorraine Temple provides an in-depth look at the world of dog mushing and the Iditarod, Alaska's great sled dog race, including the training, racing and breeding of these champion sled dogs. Just as the lure of gold brought the miners to Alaska over 100 years ago, it still does today. Many areas available for recreational gold panning include the scenic Kenai Peninsula. Chugach is the second-largest national forest in the country. Its 5,940,000 acres spread across three distinct landscapes, stretching from the Kenai Peninsula east across Prince William Sound. Kenai National Wildlife Refuge was established as a way to protect the moose from market hunting, and stretches across 2 million acres, including the western slopes of the Kenai Mountains.